One of the main improvements in the newly-redesigned Nomisma web architecture is in the administrative backend, not visible to the public. 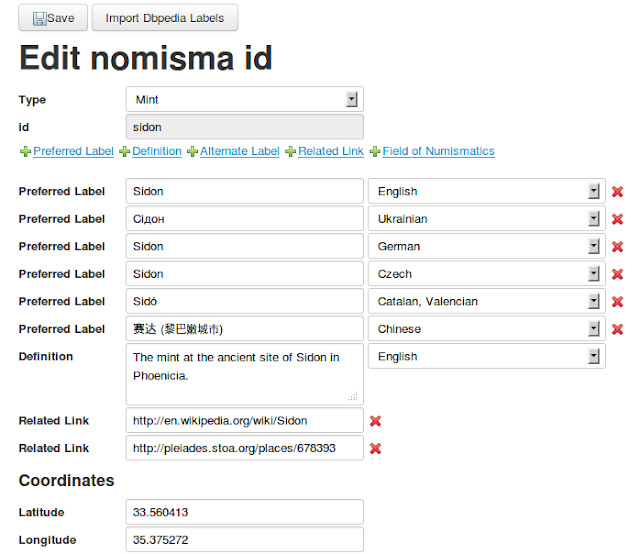 The previous iteration of Nomisma was built on top of open source wiki software. Each id was an XHTML+RDFa fragment in the filesystem, created and edited through the wiki. There was no validation, and the hand-coding of XHTML fragments occasionally led to human error: invalid XML documents which occasionally broke page loads or RDF distillation. We needed to move to a more stable and scalable infrastructure. The XHTML+RDFa fragments remain a part of the new architecture of Nomisma, now maintained in a GitHub repository. The fragments are now edited in an XForms interface with the Orbeon processor, which enables not only editing of XML, but a variety of REST interactions to get and post data into the Apache Fuseki RDF triplestore and SPARQL endpoint, and post data into the Solr search index, which powers the Atom feed. While the XForms web forms handle the simplest of XHTML templates, such as those for authorities, mints, regions, etc., it does not yet handle editing of more the more complex data models, such as those for IGCH hoards (like http://nomisma.org/id/igch0200) or coin types (for example, http://nomisma.org/id/rrc-174.1). However, hoards and coin types are least likely to be manually edited, so the editing interface is most useful for those numismatic concepts which are most likely to be enhanced with additional labels and references to other linked open data identifiers (like VIAF or Pleiades ids). A similar query is passed from Orbeon to the endpoint to generate an XForms instance for nm:field_of_numismatics (e.g., Greek Numismatics, Roman Numismatics, etc.). Languages (xml:lang in the div) are also tied to an instance which contains every ISO language code and label. XForms bindings and XPath also ensure that other requirements of the XHTML document are met: there must be an English preferred label, the labels cannot be blank, there can be no repetitive languages for preferred labels, latitude and longitude must be decimal values between -180 and 180, and related links must be valid URIs. Thus it is easily to rapidly and easily incorporate new labels into Nomisma to facilitate multilingual interfaces in other projects which depend on it for data (like OCRE and the UVA collection). Since the ids need to be maintained in GitHub in the long-term, the editing workflow requires the loading and saving of XHTML+RDFa fragments in the filesystem rather than through a REST interface like eXist. After the RDF is updated in the endpoint, the XHTML+RDFa is serialized into a Solr XML document and posted into the search index (for the Atom feed, although we may implement faceted search/browse eventually). After the doc is sent, a commit is sent to Solr. Finally, a nightly cron job adds new files into the GitHub repo, and then changes are committed and pushed into GitHub. Another job then runs to generate RDF dumps of the Nomisma data, which are available on the nomisma.org home page. This is the gist of the editing workflow in the new version of Nomisma. I plan to improve the XHTML+RDFa editing templates to support a greater degree of complexity in the data model. Additionally, I aim to create an administrative interface to better manage datasets provided by other institutions. The endpoint includes not only Nomisma ids, but RDF provided by OCRE, UVA, CHRR, the ANS, and a portion of the Berlin coinage for Augustus. I want to be able to get VoID RDF files from new data contributors and do consistency checks on RDF dumps before ingesting them into Fuseki. I also want to be able to delete or update all triples from a single institution. This functionality will come eventually. It will become a higher priority once there are more contributors of numismatic data to Nomisma. I am the Web Services Developer for the American Numismatic Society with an MA in classical archaeology from the University of Virginia, working on a variety of open source cultural heritage web and linked data projects (mainly related to coins, pottery, and ancient people). Additionally, I am engaged with several 3D visualization projects. I have worked on models of the House of the Faun in Pompeii, House of the Drinking Contest near Antioch, and IATH's Rome Reborn, as well as 3D modeler for the Pompeii Forum Project.